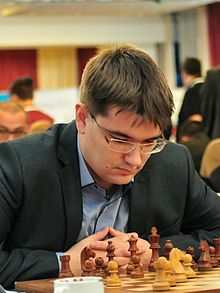 Evgeny Yurievich Tomashevsky (Russian: Евгений Юрьевич Томашевский; born 1 July 1987 in Saratov) is a Russian chess Grandmaster. In 2001, he won the Under-18 Russian championship in Rybinsk with a score of 9.5 points out of 11 games and in 2004 he was the runner up in the World U18 Championship. In 2007, he came second in the Aeroflot Open. In 2009, Tomashevsky won the 10th European Individual Chess Championship after tie-breaks. The decisive match against Vladimir Malakhov went into armageddon stadium, where Malakhov blundered a rook in a winning position. He was a member of the gold medal winning Russian team at the World Team Chess Championship 2009 in Bursa. In 2011, he tied for first place with Nikita Vitiugov and Lê Quang Liêm in the Aeroflot Open, placing third on tiebreak. He was one of the seconds to Boris Gelfand for the World Chess Championship 2012. In February 2015, Tomashevsky won the FIDE Grand Prix in Tbilisi as a clear first. He scored 8/11, with no losses and wins over Jobava, Grischuk, Mamedyarov, Vachier-Lagrave and Kasimdzhanov. His performance rating in this tournament was 2921. In August 2015, he won the Russian Championship Superfinal in Chita with 7.5/11. Partly for being a mostly positional player, partly for wearing glasses and being well-educated, Tomashevsky earned himself the nickname "Professor" among the chessplayers.